Mark's Birth Day! I had gained 21 pounds. I was so excited to finally be pregnant! After about a month on bed rest due to bleeding during the early part of my pregnancy with Mark, I was back on my feet and found that I loved being pregnant! I wanted to do everything I could to have a healthy baby, so I ate right, avoided all the foods on the no-no lists, stayed active and exercised, and read every book about pregnancy and babies I could find. I enjoyed several baby showers, and Bill and I loved watching my tummy grow bigger and seeing it jump when Mark had the hiccups or just seeing him move around! I gained 21 pounds during the pregnancy and was active to the very end. My pregnancy with quintuplets was definitely different from that one! Because there were so many babies needing nutrients to grow, the diet was completely opposite this time around. I aimed for 5,000 calories every day and avoided too many fruits and vegetables because they took up too much tummy space without adding many calories. I ate a lot of cheeseburgers and drank a lot of milkshakes. Bill made me a special milkshake every night that had extra protein powder and totaled 1,000 calories. My activity level was limited from very early on. At 12 weeks into the pregnancy, the doctor did a cerclage, which is where he stitched my cervix shut to help prevent an early delivery. From that point forward, I couldn’t lift Mark any more, couldn’t do stairs and stopped driving. The hardest part was not being able to care for Mark the way I used to. We had a wonderful nanny that summer who came to our house every day. It was nice that I could get all the rest that I needed but that I could still see Mark and spend time with him every day too. He and I spent a lot of time cuddling on the couch reading books or doing puzzles. At 16 weeks, I had gained the same amount and measured the same size as when I delivered Mark! I started feeling some minor occasional contractions at 18 weeks into the pregnancy. A nurse came to the house and set me up with a home monitor. This had a belt that went around my stomach and hooked to a machine where it measured the number of contractions. I used it for one hour per day and then it sent the data to a nurse who checked to make sure everything looked fine. This was great! It gave me a lot of peace of mind and was a way to check for contractions if I was nervous without having to go to the doctor’s office or the hospital. The nurse also set me up with a terbutaline pump which helped slow contractions. It had a small sub-cutaneous needle that inserted the tubing into my thigh and a tube that connected to the medicine in the pump which was about the size of a pager. My activity level was definitely restricted more at this point. It was hard being home and limited, but I was happy to do anything I could to keep the babies inside as long as possible. It is hard to be home all the time and / or to be on bedrest. When I felt down or lonely, I kept thinking about the babies and what they would be like. I read a lot of books, ate almost all the time, slept when I could, and really appreciated friends who came to visit! A couple of friends who had kids the same age as Mark made sure to include him on many of their outings and had him over to play frequently. While it was hard to miss out on those things with him, it made me feel so much better that he was still getting to be an active 1-year old and play with friends, and I am so grateful for those friends! When the summer ended, our nanny left, and Mark went to day care for a couple of months. Mark says Hello to babies. I'm 19 weeks along. Hurricane Ike hit Houston when I was 26 weeks pregnant with the quintuplets. We stayed put at home and weathered the storm with very minimal damage. We were without electricity for 5 days and were grateful for the cooler weather. That being said, it was still September in Houston, Texas and being as huge as I was made me pretty hot! It was fun having Mark home for an extra week with Bill home to take care of both of us, and we enjoyed being outside and visiting with neighbors. I was large enough that I couldn’t sit up comfortably for very long, so I would go sit outside to cool off then come lie down inside to get comfortable, then rotate through those two spots again. I was able to stay at home until 29 weeks into the pregnancy when my scenery changed, and I checked into The Woman’s Hospital of Texas. 28 Weeks Along with 5 babies! A normal pregnancy with one baby is considered full term at 40 weeks, but average delivery for quintuplets is between 27 and 28 weeks. While we hoped to make it as long as possible, we knew the challenge that would be. I was admitted to The Woman’s Hospital of Texas at 29 weeks pregnant due to pre-term labor. The medical staff was able to get the contractions under control, but I stayed in the hospital until the babies were delivered at 33 weeks. We were blessed with three girls and two boys: John, Becca, Ali, David and Kate. We are so grateful that, despite a few bumps along the way, they were born healthy and have continued to be so! Today we have six active, healthy children who keep Bill and me on our toes every day! 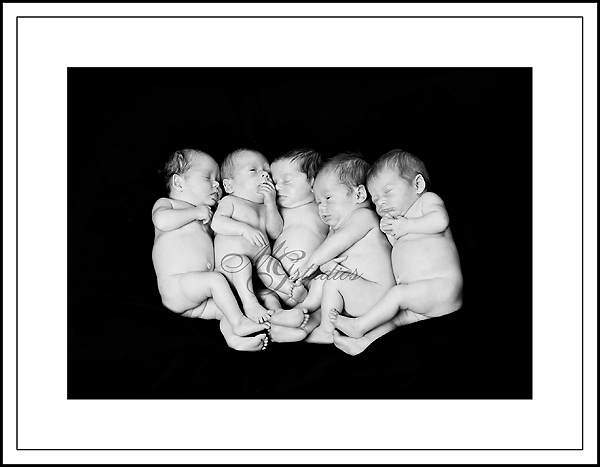 Mark turned 4 this week, and our quintuplets are 2 ½. Join me as we share our journey!